Waking up fifty years early, on a strange ship, after being frozen for many year would definitely be frightening and confusing. Beth Revis tells a thrilling tale of lies, love, the future, and self discovery. 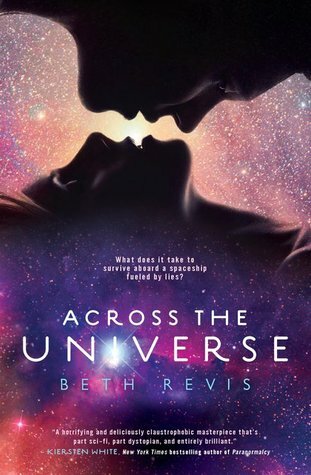 I enjoyed Beth Revis' debut novel from the very beginning. Although it is a little creepy to begin with, when the young protagonist and her parents are being frozen, it sets the tone for the thrilling science fiction novel. From the start, the story twists and turns in unexpected ways, making it a fantastic journey. I had a great time with this book, really getting into the story. One of my favourite parts about the book was the double point of view. There were two characters telling their sides of the story. Elder was my favourite character. I thought his story was fascinating when you saw it through his eyes. The emotions and secrets Elder has throughout the book added a lot to the overall book. What I also enjoyed while reading this book, was that the story didn't skip the time where Amy was frozen. Beth makes the story even deeper and chilling with the thoughts and dreams Amy has while frozen. She is not supposed to be, but she is semi-conscious of what is happening outside of the coffin she is frozen in. When Amy is woken up, an undercurrent of the storyline was question of who pressed the button, who nearly killed her. There were a few clues that weren't very apparent throughout, because you weren't looking out for them. In the end, I was a little shocked, but also quite pleased in a strange way. I also loved the relationship between Amy and Elder. I loved how attached he felt to her...it was very cute. Overall, I thought this book was fantastic, blending a great balance between Amy's life as she remembered it on Earth and the new discovery she made when she awoke on the ship, Godspeed. This book has earned itself a four! I can't wait for the upcoming books in the series!